1. Combine all the ingredients together in a microwave safe bowl. Make sure you beat the eggs separately before adding to the other ingredients as it is difficult to beat them properly after they are added to the ingredients due to the butter cubes. If it isn’t mixed well enough you do risk getting some white specks of cooked egg whites in the end product. Don’t panic though if you do, you can always strain these out at the end. 2. Cook the mix in the microwave for 6-8 minutes on medium power, stirring regularly until the mixture thickens. I stir the mix every 20 – 30 seconds. It may seem like it is never going to thicken, however around the 6-7 minute mark you will find it suddenly thickens very quickly. 3. Strain the curd through a sieve after it has finished cooking and has thickened. Place in an airtight container or sterilised jars and keep in the fridge for up to two weeks. To sterilise jars, wash them in warm soapy water, and then place in a low oven to dry. You will only need to use part of this for the mousse. Allow to cool in the fridge before using in the mousse. 4. To make the gingernut crumble, preheat your oven to 180C fan forced (200C without fan). Line a baking pay with baking paper. 5. Beat the butter, sugar, treacle and egg yolk together in a bowl until combined (you can use a stand mixer, electric hand beater or do this by hand). Once combined, sift in the flour, bicarb, ginger, mixed spice and cinnamon. This is just to get rid of any lumps and combine the dry ingredients as they go in. 6. Using your hands, mix the ingredients together until the come together to form a dough (it will be quite dry). If it is a bit sticky add a little more flour. Make the crumbs by pushing/rubbing the dough through your fingers over the baking tray. 7. Bake for approximately 8 minutes (will depend on how large/small your crumbs are) until golden. Remove from the oven and set aside to cool. Once cool, store in an airtight container until needed. 8. To make the mousse, whisk the cream cheese in a large bowl until soft and smooth (again, you can use a stand mixer, electric hand whisk or do this by hand – although it will take longer by hand). Once soft and smooth, add the cream and condensed milk and whisk until thick and creamy. It will get lighter (i.e. more mousse like) and creamier the longer you whisk. 9. 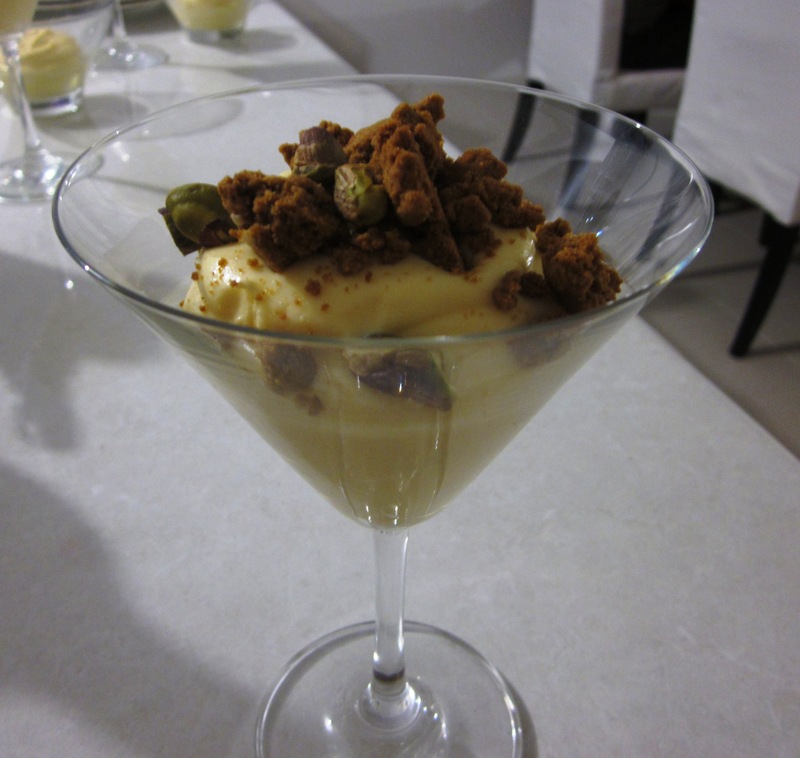 Once thick and creamy, add the lemon/lime zest and juice as well as the 150ml of lemon curd. Whisk for a few seconds more only. 10. You can serve immediately or store in the fridge until you are ready to serve. 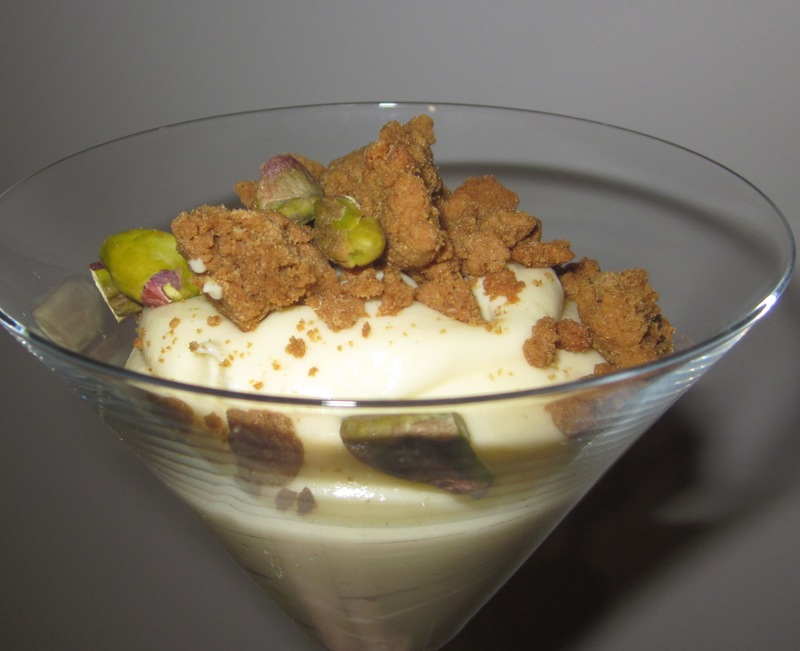 To serve spoon (or pipe) the mousse into six glasses and top with the crumble and pistachios.